can result in both cutaneous and systemic manifestations, and can range from mild to severe symptoms. A severe form of this allergy is the Systemic nickel allergy syndrome, clinically characterized by cutaneous manifestations (contact dermatitis, pompholyx, hand dermatitis dyshydrosis, urticaria) with a chronic course and systemic symptoms (headache, asthenia, itching, and gastrointestinal disorders related to histopathological alterations of gastrointestinal mucosa, borderline with celiac disease). This review aims to briefly update the reader on past and current therapies for nickel contact allergy. Nickel is the main sensitizer; its prevalence varies from 4.0 to 13.1% in different countries and is still increasing. Nickel allergy is more common among women than among men (17% and 3%, respectively). This difference is due to different rates of exposure of skin to this substance; such exposure (from jewelry, leathers, etc) is more frequent among women. Makes sense, can I go shopping now! Nickel allergy has also been noted as prevalent among certain workers, such as hairdressers, domestic cleaners, metalworkers, and caterers, owing to their repeated exposure to this metal. Furthermore, nickel is present in a large number of foods (mainly vegetables), another source of exposure for sensitized patients. Of most concern, however, is an allergic reaction to an artificial joint that contains nickel or a cross-reacting derivative, chromium. What can one do? 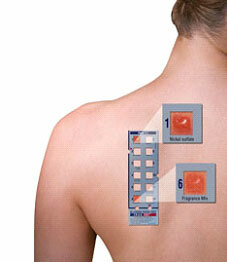 Patch testing with a metal series or the T.R.U.E. test is the only way to know for sure! Topical treatment is the first-line therapy for hand contact dermatitis and is also associated with systemic supportive therapies in chronically relapsing patients with severe allergy. Tacrolimus and pimecrolimus, on the other hand, are antiinflammatory, have immunomodulators that belong to the class of topical calcineurin inhibitors (TCIs), and provide clinicians with steroid-sparing options in the long-term topical treatment of ACD. TCIs are indicated when topical corticosteroids are not indicated or when an anticipated lengthy treatment would lead to inevitable adverse effects. Here’s a treatment doctors often forget about—>Phototherapy is very effective in the treatment of hand eczema; narrowband ultraviolet B (UVB) therapy has demonstrated clinical efficacy also in therapy for psoriasis and atopic dermatitis. The safety and efficacy of this therapy in cases of hand eczema was evaluated in a randomized controlled prospective study of 15 patients who had no response to conventional topical therapy. The patients were treated three times weekly for 9 weeks with narrowband UVB on one hand and with topical photochemotherapy using 0.1% 8-methoxypsoralen gel on the other hand. Patients were assessed once each week during the treatment period and were evaluated 10 weeks after the last treatment. All of the 12 subjects who completed the trial improved, showing a statistical difference between modalities. Both broadband and narrowband UVB appear to be as effective as topical psoralen plus ultraviolet A (PUVA) therapy in the treatment of chronic hand dermatitis. However, the risks of phototoxicity and dyspigmentation associated with local PUVA therapy make UVB therapy a preferable initial therapeutic option. Systemic immunosuppressive therapy may be considered for those cases of hand eczema that are refractory to topical steroids and phototherapy. If ACD involves an extensive area of the skin (> 20%), systemic steroid therapy is required. In general, oral prednisone should be tapered over 2 or 3 weeks because rapid discontinuation can cause rebound dermatitis. Similarly, the usefulness of cyclosporine for this condition seems limited to the short term. Although one study demonstrated prolonged disease remission in 74% of patients 1 year after a 6-week course of cyclosporine (3 mg/kg/d), other studies have shown high relapse rates within weeks of drug discontinuation. Cyclosporine is probably not worth the risk. Nickel, as other allergens, may interact with essential divalent ions with similar chemical properties at ionic sites of important biomolecules. Based on animal studies, some effects of nickel may be eliminated or reduced by supplementing with divalent essential metals. Weissmann and Menné reported cases of nickel dermatitis as having improved following oral administration of zinc sulfate (ZnSO4). One clinical study showed that the administration of ZnSO4 could improve the clinical manifestations of nickel contact dermatitis and could eliminate or reduce the majority of patch-test reactions; intolerance to ZnSO4 was not observed. The study showed that ZnSO4 therapy is efficacious and safe. Patients with diffuse manifestations can reduce clinical cutaneous and gastrointestinal symptoms by following a diet with a low nickel content. Nickel frequently contaminates food, and avoiding it is very difficult. The daily intake of this metal with food is about 300 mg, mainly from oatmeal, nuts, cocoa, chocolate, and soybeans. In sensitized patients, nickel ingestion could cause a recurrence of chronic contact dermatitis but could also cause flare-ups of other dermopathies such as those triggered by immunoglobulin E (IgE)–mediated allergy (mainly urticaria). This evidence suggests that nickel allergy may be not only mediated by type I and type IV Gell and Coombs reactions. The normal daily dietary intake of nickel ranges from 0.02 to 0.48 mg. Many studies have demonstrated the relationship between nickel ingestion and dermatitis flareups. In 2006, Jensen and colleagues reported the results of a meta-analysis of these studies performed to determine the median values of nickel that could elicit allergic reactions. It has been demonstrated that nickel sulfate may provoke chronic eczema when orally administered in the range of 0.6 to 5.6 mg daily as a single dose, and there is much evidence of this relationship (eg, flareup of eczema upon dietary oral nickel challenge, improvement of eczema after starting a low-nickel diet, and management with oral disulfiram or hyposensitization therapy with low-nickel doses). This by the way, isn’t traditional wisdom to treat a skin allergy (nickel) with dietary manipulations such as low nickel diet. Disulfiram (Antabuse, Wyeth-Ayerst, Philadelphia, PA) is a nonconventional pharmacologic agent used in therapy for nickel contact dermatitis. It is a chelating agent for metals such as nickel and cobalt, but its main use is as supportive therapy for alcohol addiction. The concept of immunomodulation, developed in the 1990s, is as follows: the induction of tolerance to a specific antigen may be obtained by a mechanism of active suppression or by the induction of a clonal allergy. The experiments of Bagot and colleagues, carried out in a double-blind-versus-placebo study, clearly demonstrated that oral nickel administration in humans may importantly reduce the number of circulating T-cell lymphocytes activated against this antigen. In 1992, Van Hoogstraten and colleagues demonstrated that complete tolerance can be maintained for 2 years as long as oral contact with the allergen is avoided. Oral administration of nickel could induce an immune-specific tolerance by a clonal expansion of subtypes of CD4+ T-cell clones, T-regulatory cells, with suppressing activity that limits tissue damage and inflammatory-response T-regulator cells. In 2009, the authors performed a clinical trial of oral hyposensitization therapy with low doses of nickel in 67 patients affected by systemic allergy to this sensitizer. All patients reported a significant benefit in regard to both cutaneous and systemic symptoms, with the reduction or absence of itching and partial or complete clearing of ACD after the first 4 weeks of treatment. In fact, 70% of the patients completed the increasing phase (10 weeks) and the maintaining phase with the following results after the reintroduction of a nickel-free diet: 67% reported a complete remission of symptoms; in 23%, a clinical improvement was noted, with the rare appearance of cutaneous or digestive symptoms of lower intensity; and three patients also reported a reduction in weight. Adverse reactions were observed only in 18 patients: 12 patients with primary cutaneous dermatitis reported mild itching, and 6 patients with gastrointestinal manifestations reported digestive disorders of low intensity. This systemic therapy led to favorable results both in regard to cutaneous symptoms and in regard to gastrointestinal histologic modifications induced by nickel allergy, in contrast to all other therapies that could only act on the dermatitis.